← Musings – Climate Change and Science? Do you wonder why so many news people (not just the main stream media) are thought to be purveyers of “FAKE NEWS”? Well, here’s an example of why. 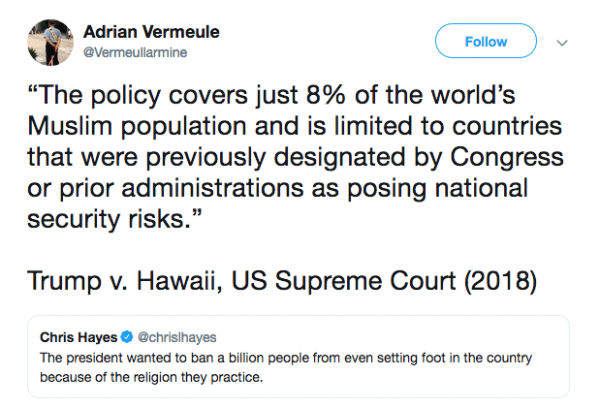 Even knowing better, Chris Hayes of MSNBC continues to circulate this lie, without conscience, relentlessly while knowing full well his claim is an outright lie. 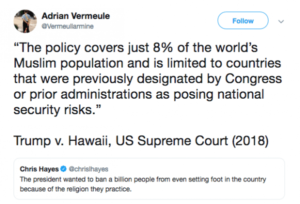 Fortunately, we have people like Adrian Vermeule, a Harvard professor of constitutional law, to call him out. Professor Vermeule notwithstanding, this works for the Left because many (most?) Americans are too emotionally committed to their world view to entertain the notion that the media know them to be easily misled.